When we started doing Rallyverse a few years ago, “content marketing” wasn’t really a thing yet. Sure, there were early adopters and enthusiasts at brands and agencies, but, as a label (much less a discipline), it wasn’t widely understood. Everyone is a content marketer. Especially in B2B scenarios, sellers are being challenged to connected with a new type of buyer, one who’s comfortable doing their own research and is looking for a consultation more than a quote. We see many of our customers looking to arm their sales force with great content so that interactions with prospects on social media and beyond are informed by the sorts of conversation starters that will build trust — and lead to sales. Candidates are smart about learning about prospective employers before and during the job application process. Human resource departments have responded by building out content strategies to share details on their company — everything from products to leadership to everyday culture. Whether it’s on LinkedIn or a YouTube channel, HR now must take on the challenge of telling their company’s story, or risk missing out on the best candidates. Content has always been an important part of the customer support process, but customers today demand more than just a pdf of a user guide. Today’s consumers expect how-to videos and even GIFs to help them to troubleshoot potential issues. And all of those assets are a great opportunity for the brand to connect with customers and tell its story. CEOs and other executive leaders have embraced content marketing as a way to tell their company’s story while demonstrating industry thought leadership. From LinkedIn Influencer posts to active (and sometimes feisty!) Twitter accounts, content marketing is now part of the CEO’s role (and companies with social CEOs tend to outperform competitors). Oh right. The folks that started all of this. While content marketing might be identified as a separate discipline in the marketing department, smart marketers have realized that managing content isn’t a campaign or tactic, it’s the fuel that drives most marketing activities. From the company web site to email marketing to social media to providing content to support other departments’ initiatives, marketers know that content powers it all. Content marketers have a big challenge: creating new, relevant and great content and information for their audience, customers and prospects everyday. Your audience expects you to deliver great content from your own creation but also content from trusted sources. We have published several articles and slideshare on the Golden Ratio – go read about how other brands use 3rd party content to support their brands and customers. Your audience is seeking insights and answers that you can solve for them with trusted content. You just have to be in the know and this is what Content Curation will do for you. Brand and Content marketers are leveraging technology to support their teams in doing a better job for their customers and prospects. An important part of this technology is a enterprise curation solution – usually part of a complete content marketing platform. These technologies help the brand marketers build stronger and deeper relationships with their customers and prospects. How by solving the Top 3 Content Marketing Challenges. a) bringing the trending content important to your audience to you. No more searching the web for what is trending about the topics you and your customers care about. All that content is at your finger tips. b) making the content actionable. In just a few clicks you can take that content or idea and produce your own engaging blog post, social media tip or instagram image. Or you can share the content you found with your audience. Or you can put this content into the hands of your field marketing and sales teams. You move from finding content to putting it to work for your company and customers. c) keeping track of what content and topics your brand is engaging with. 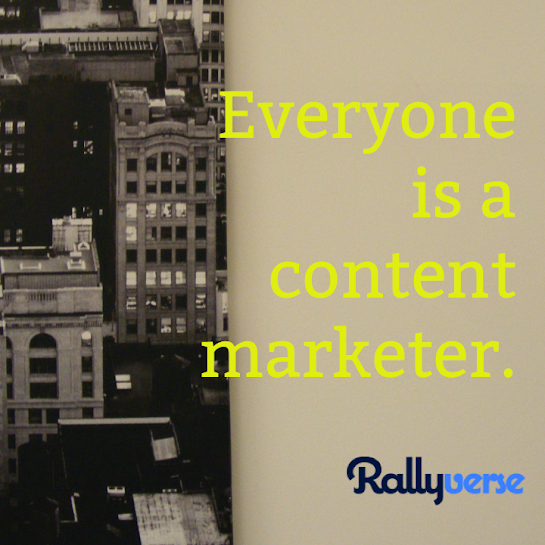 Rallyverse knows what content you share and what content your audience engages with. You get the insights into what is working for your brand and what is not working for you brand. And best yet, we use that data to give you better content every day. So now that we made it easier to produce more content you need to make sure that content is all on message and strategy. An enterprise content curation solution will ensure that all the content that is being recommended to you is on brand and strategy. This means that your brand looks more consistent and reliable in the eyes of your customers. We all deal with churn in our marketing teams whether it is due to promotions, new hires, change in scope, we always have new people on the team. An enterprise curation solution can help with keeping your content marketing consistent in the wake of personnel changes. Your strategy and what your brand is looking for is well defined in the set up of a enterprise curation solution like Rallyverse so the new personnel can come up to speed much faster not only by understanding what are the inputs to your brand content strategy but also the outputs. Making it faster and more seamless transition when you add new people to the team. Have you given an enterprise curation solution a try? If not, go check out Rallyverse and see what it can do for you and your company. You can Increase your Online Presence with this one curation tool. You know that the more relevant, interesting, and entertaining the content that you create, share and publish, the more your audience will view you as a trustworthy source of information and not just a provider of a product or service. That perception and online presence builds your brand, trust and deepens relationships with your customers. It helps your customers and prospects know who you are through what content you create and share. It helps your customers and prospects solve real business problems by learning from you and your content. But creating that content is hard. To help you spur those creative juices and give you great ideas, you need some ideas and stimulus flowing to you. Ideas that reflect your brand, your company, your positioning in the market. To do so, you need a content curation tool to help you get those ideas to you and back to your customers and prospects. Content curation is the practice of seeking out and sharing content with your customers and prospects that is relevant you your brand and to them. It can be done through your blog, email marketing, your website, or social media channels. The key to successful curation is to discover content that represents your brand and is useful to your customers and prospects. Trending content is even better, meaning that you are ahead of the rest of your competitors and your customers giving them content that they will love. Now finding content across the internet is difficult and time consuming. Not to mention fraught with errors and inappropriate content. Ad once you have the content you need to bring it into a tool to create new content and to share it with your audience. Lucky for you we know of the single content curation tool you will ever need – Rallyverse. Rallyverse is much more than a content creation and distribution tool. It is a complete content marketing platform that is anchored by the most powerful Content Curation engine in the industry. Rallyverse has built a Enterprise Content Curation Engine with a machine learning algorithm that learns about your brand, business and audience the more you use it. It is an engine built for you and your business. There are lots of personal curation tools out there but those don’t cut it for your business. You need the controls and capabilities for customization so you can really hone in on the content that moves the needle for your business. Want to learn more read about the difference between Enterprise and Personal Curation here. Not only do you need to curate content from across the web but you need to curate content that you own. That is why Rallyverse builds your very own Brand Library allowing you to find trending content from your own archives and get the most out of the content you have already produced. Rallyverse understands deeply that the Most Important Content you should Curate is your Own. So if you aren’t using a content curation tool now, go get yourself the One Curation Tool you need – Rallyverse. If you already have a content curation tool, check out Rallyverse and see what it can do for you and your business.